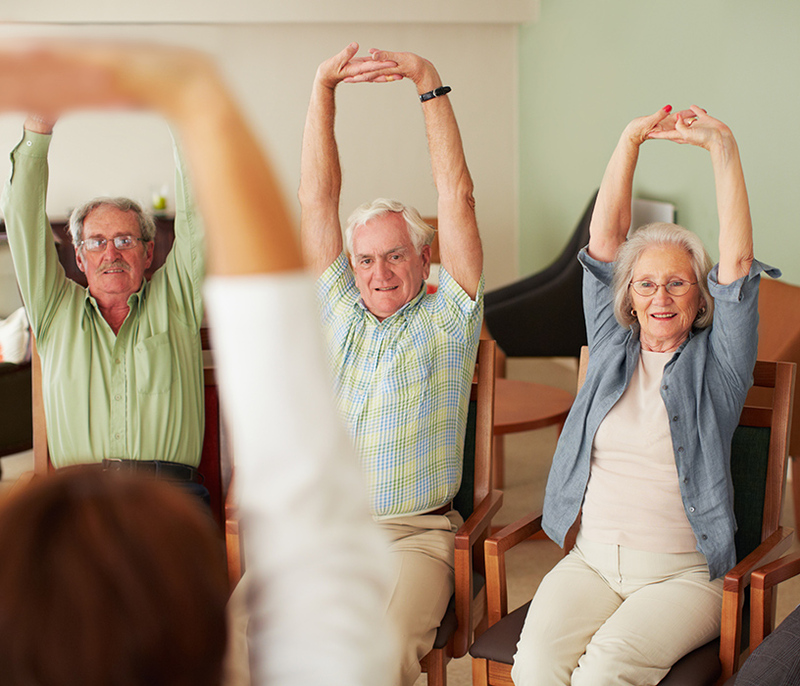 Two online resources available to find local wellness classes for seniors. Through a network of local leaders, community organizations and health systems, Juniper delivers programs to help adults manage chronic health conditions, prevent falls, and foster well-being. If you are coping with high blood pressure, heart disease, COPD, arthritis, diabetes or other chronic conditions, Juniper can support your efforts to live life as fully and independently as possible. The next class will begin February 13, 2019. Learn more and register here or by contacting Jodi Johnson or 651-565-5200. Participants meet for two hours a week for seven weeks. Classes are highly participative; mutual support and success build participants’ confidence in their ability to manage their health behaviors, reduce their risk of falls, and maintain active and fulfilling lives. Classes are facilitated by trained leaders and provide a safe and positive learning experience. Learn more about classes listed on Juniper in Wabasha County. An innovative collaboration of individuals and organizations in Southeast Minnesota, WellConnect is focused on optimizing health and wellness in this region. The organization started in 2015 with a handful of folks in Rochester, MN with a big idea for improving healthcare, and since that time they have held regional meetings, conducted research and engaged new partners. Now they are an entire community system that includes 11 counties, more than 20 organizations and growing! If you live in Southeast Minnesota, WellConnect is for you! Learn more about classes listed on WellConnect in Wabasha County. STAY ACTIVE & INDEPENDENT FOR LIFE (SAIL) - a strength, balance and fitness program for older adults. SAIL will help you stay independent, active and prevent falls. 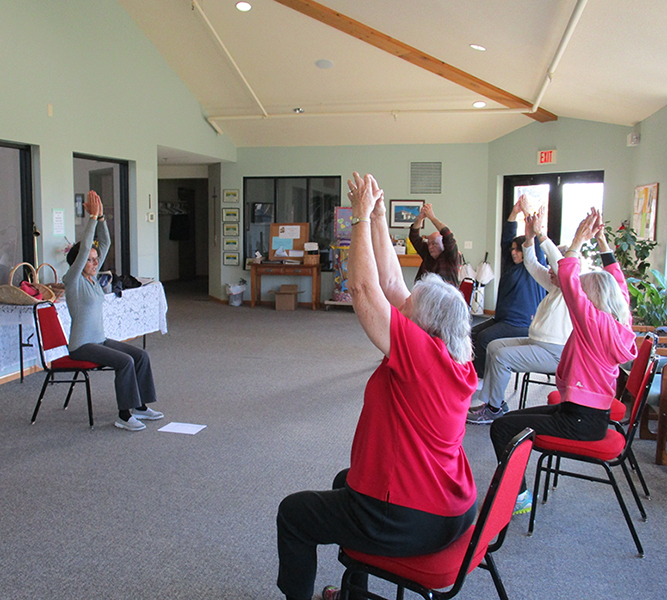 Exercises can be done standing or sitting and include aerobics, balance, strength, stretching, and falls prevention group education. Performing exercises that improve strength, balance and fitness are the single most important activity that adults can do to stay active and reduce their chance of falling. Classes are held Tuesdays and Thursdays in Lake City. Register here or by calling Mariah at 507-450-1091. ARTHRITIS FOUNDATION EXERCISE PROGRAM - low-impact physical activity program proven to reduce pain & decrease stiffness. This class is for older adults with arthritis, chronic pain, or joint and muscle stiffness. The routines include gentle range-of-motion exercises that are suitable for every fitness level. Movements can be performed seated or standing, and include endurance, balance, strength, flexibility, relaxation, and health education topics. Classes in Lake City and Plainview. Register here or by calling Sue Degalier at 507-450-0287. Wabasha County Public Health adds support tools to improve client health. Wabasha County SHIP invited the American Lung Association of Minnesota (ALAMN) to present on tobacco to Wabasha County Public Health in December of 2017 which expanded into an important partnership. ALAMN provided the Wabasha County Public Health department with a CoVita Smokerlyzer® - a device to test Carbon Monoxide (CO) levels. CO is a poisonous gas that emits in car exhaust, fumes and tobacco smoke. CO, tar and nicotine are the main components found in tobacco smoke, and all have health risks. The Smokerlyzer can test the amount of CO in the air or breath. This is a non-invasive way of showing the level of CO in the blood. Within 24 to 48 hours of not smoking, a smoker can be at non-smoker levels. Something as simple as cutting back on smoking can better a person’s life and make positive health changes. Wabasha County Public Health wants to give community members this incredible opportunity to have their CO levels tested, and will use the monitor on tobacco smokers for clients of WIC, MCH and Home and Community-Based Services. This is a wonderful tool that can judge the severity of a client’s dependence to tobacco and can be a motivational opportunity that may help change a client’s life. Reducing smoking not only helps Wabasha County Public Health clients, but also their loved ones and others around them. 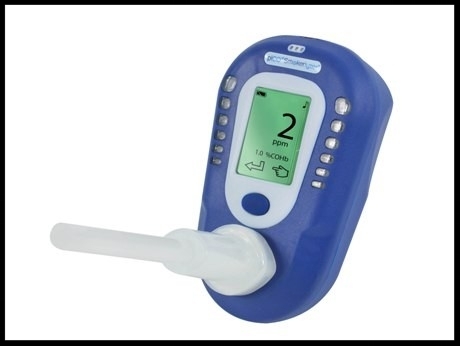 A CO monitor can detect second and third hand smoke in a person’s lungs, even an unborn fetus. This is an instant feedback that can encourage healthier living. Current and future Women Infants and Children, Maternal Child Health, and Home and Community based Services Clients will be asked by their home visiting nurse, or in the office if they would like to take advantage of this opportunity. Nurses in these programs will be doing assessments and speaking with clients on an individual basis. SHIP staff has also created a CO tracker for clients to see the changes they are making in their quit attempts and CO levels. Along with the monitoring device and tracker, clients will also be given the opportunity to work with public health staff trained in motivational interviewing through SHIP support. Other cessation materials will be given to clients to help them continue on their road to quitting. Wabasha County Public Health is truly going above and beyond to support their clients and help them through every step of their health changes. Wabasha Ambulance Service launched home safety checks for seniors in Wabasha County. The Wabasha County Senior Action Team has been supporting a falls prevention program conducted by Wabasha Ambulance Service. The team was awarded a Statewide Health Improvement Partnership (SHIP) grant to provide home safety checks as a tool to help seniors reduce their risk of falls and live longer in their homes. Wabasha County Senior Action Team is helping lead the safety check pilot program, which launched last fall. Senior health was a top priority identified in the recent Community Health Needs Assessment. Wabasha Ambulance staff have been making in-home visits, which include a walk-through of the home and entryways, an optional blood pressure check, safety recommendations and resources. A follow-up call will be placed to the resident to do see what progress has been made to reduce falls risks and to identify if changes need to be made to the program. The goal is to complete 24 checks during the pilot phase, review and refine the process and launch a sustainable program through Wabasha County Ambulance. The pilot’s initial target population included residents age 55 and older who wish to remain in their homes, want to reduce their risk of falls and have participated in one of Wabasha County’s five senior classes. 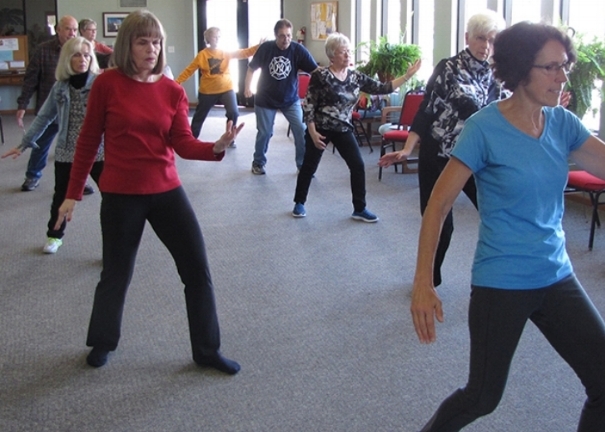 Those classes include Matter of Balance, Living Well with Chronic Conditions, Living Well With Chronic Pain, Tai Ji Quan, Powerful Tools for Caregivers and Fit City Seniors (to learn more about these classes, call Wabasha County Public Health at 651-565-5200 or go to www.wellconnectsemn.org). The project has branched out beyond the initial target group to include long-term care! During a Senior Action Team meeting which occured on January 4th, it was discussed, they are waiting for feedback from Wabasha Ambulance and they will plan to evaluate the project soon. SHIP looks forward to hearing how the process is going and how they may adapt to keep the project sustainable. Mini grant applications were due February 23, 2018. A second round will take place with a deadline to be announced. If you would like information on what it means to partner with Wabasha County SHIP on healthy eating, physical activity, and/or tobacco-free environment projects, please email Tina Moen or call her at 651-565-5200. Balance support improves the quality of life for seniors in Wabasha County. “I'm already noticing a difference in my physical being. I'm sure I'm a little more mobile than I had been, and I plan to continue these exercises. Hopefully, I'll be jumping over the moon...soon!" The Wabasha County Senior Action Team was awarded a Statewide Health Improvement Partnership (SHIP) grant to support the introduction of home safety checks. These safety checks are supported by Wabasha County Ambulance as a tool to help seniors reduce their risk of falls and live longer in their homes. The Team has been diligently planning to kick off an in-home environmental safety check pilot. In our most recent Community Health Needs Assessment, senior health was identified as a top priority and there are hopes to launch the pilot program summer 2017. The pilot’s target population will include seniors ages 55 and older who wish to remain in their homes and reduce their risk of falls, as well as have participated in one of the following classes: Matter of Balance Living Well with Chronic Conditions, Tai Ji Quan, Powerful Tools for Caregivers, Fit City Seniors. Previous participants have been selected as they are already engaged and have seen the benefits of support offered by the Senior Action Team. Many activities of daily living – standing from a seated position, climbing stairs, reaching while maintaining balance – are easier and safer because the methodical series of exercises have strengthened stability, muscle tone, and flexibility. Wabasha Ambulance will make the in-home visits which will include a walk-through of the home and entry ways, an optional blood pressure check, safety recommendation, resources, and a follow-up call will be placed. It is a goal to complete 24 checks during the pilot phase, review refine and to launch a sustainable program through Wabasha County Ambulance. Call Wabasha County Public Health at 651-565-5200 to learn more or visit the WellConnect website. WellConnect is an innovative collaboration of individuals and organizations in Southeast Minnesota that is focused on optimizing the experience of health and wellness in this region. The group started in 2015 as a handful of folks in Rochester, Minnesota with a big idea for improving healthcare. Since that time, they have held regional meetings, conducted research, and engaged new partners. Now they are an entire community system that includes 11 counties and more than 20 organizations (and growing!). If you live in Southeast Minnesota, WellConnect is for you! Visit the WellConnect website to learn more.